You’re a human being: you can stand up, sit down, or do a somersault. That’s because you have a skeleton that gives your soft tissue a structure. Likewise, it’s important to give your novel a structure that will hold all the soft murmurings about characters, places and events. It begins with understanding the structure of a scene. First, let’s answer the question: do you have to write in scenes? No. There’s a continuum from those who write strictly in scenes to those who don’t. 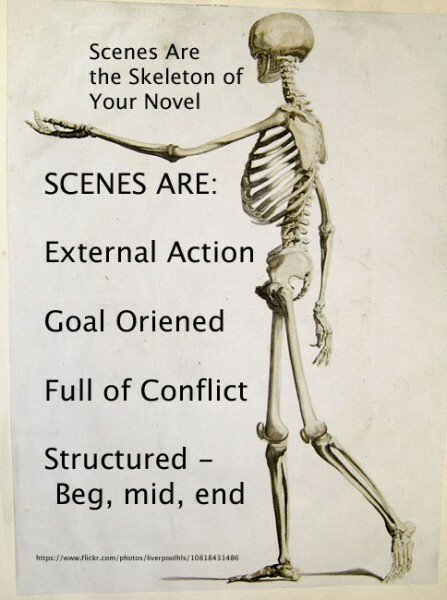 However, for beginning to intermediate writers, you’ll see more improvement in your writing if you move closer to the strictly writing in scenes end of that continuum. Early in a career, writers need discipline to add structure that may come more easily with experience. External Action. A scene is a unit or section of a story that hangs together because of the action or event. Scenes are not internal, but external. Something must physically happen. Something Changes. Something important must happen in a scene; after the scene is over, the situation must be different for the character’s lives. The definition of “important” and “different,” of course, will change with the genre, but still, we recognize that something important has created a difference. Goal Oriented. The strongest scenes begin with a character wanting something and encountering difficulties in achieving his/her goal. The goal can change or develop over the course of a story, but it must be there. Conflict. If your character wants something (Goal), and they have instant gratification (Result), that’s not a scene. Every Goal must meet with obstacles that prevent the character from achieving the goal. This is the basic promise of all fiction, that life will encounter problems that won’t be solved till the last page. Beyond these requirement, strong scenes add a deeper structure. It’s not required, for those who only write loosely in scenes, but it helps. Scenes can be divided into three or four sections: beginning, middle, turning point or pivot, ending. Beginning: This sets up the situation, setting, characters and the goal. Middle: Conflict piles on conflict as the goal gets farther and farther away. Turning point/Pivot: Something happens to spin the story in a different direction. Scenes without a pivot are possible, but scenes WITH a pivot are more interesting. A good way to see the structure of a scene is to watch the “Bar Scene” from the movie, Good Will Hunting. If you can’t see this video, click here. Beginning: Will and his friends enter the bar, choose a table, order a beer. Goal: These “Southies” want to experience a Harvard Bar and maybe pick up a girl. Middle: Chuckie goes over to check out a girl. But a Harvard man steps in to put him down. Pivot point: Will takes over the conversation with his superior intellect. Ending: Will meets the love interest. The conversation with the Harvard man is a win/lose: Will wins because he manages to make his point that a college education isn’t everything; however, listen carefully to the deeper conversation about class distinctions and you’ll see that Will still faces challenges. For more on scenes, I always recommend Sandra Scofield’s excellent book, The Scene Primer. Or see my series, 30 Days to a Stronger Series.